There has been another major humiliation for the PSNI's Paramilitary Crime Task Force as it has been revealed they have allegedly left a notebook belonging to a member of their TSG unit in the hands of loyalists. Sources have told Unionist Voice the notebook contains the personal details of a number of loyalists and republicans. This morning’s revelation in the Irish News, in relation to yet another major police data breach, will heap more embarrassment on the PSNI and their Paramilitary Crime Task Force (PCTF). It is evidently a matter of great public interest that the PSNI have once again recklessly ‘lost’ vast amounts of classified data. Sources have indicated that a PSNI TSG unit from New Barnsley were tasked- as part of a PCTF probe- to carry out searches in the West Winds and other areas of Newtownards on 3 September 2018. It is claimed that a female officer then recklessly left her notebook behind and it has been alleged that it is now in the hands of the loyalist community. Unionist Voice are aware of the identity of the officer from New Barnsley TSG, however we do not feel there is any public interest in revealing the identity of the specific officer due to the fact that dissident republicans could then seek to target the officer. Sources have told Unionist Voice that it is believed the notebook contained detailed police briefings and notes from a range of PCTF investigations. It is believed that at the back of the Police issue notebook, behind a piece of cardboard, was a number of folded pieces of paper. These documents contained lists of names and addresses of republicans and loyalists in the west Belfast area and also included their car make, model and registration. A number of prominent loyalists and republicans are understood to be named on the list. Following the latest gaffe, the PSNI desperately launched a series of raids to try and recover the notebook that they had themselves allegedly misplaced. Bizarrely they carried these raids out under Section 170 of the Data Protection Act 2018, which refers to a person unlawfully ‘obtaining’ personal data. Quite how this could apply in relation to the PSNI losing a notebook as part of yet another PCTF humiliation is beyond most reasonable people. Aggressive officers then threatened one young man claiming that they believed they had lost the notebook on his premises. It is understood they had not. The young man politely facilitated the desperate and flustered PSNI officers as they pulled out bushes, looked under floorboards and undertook a whole range of other laughable actions. There is of course a defence in Sec 170 3 (c ) (ii) of the Data Protection Act 2018 whereby it is not an offence if the person in possession of the data acts “with a view to the publication by a person of any journalistic, academic, artistic literary material” and if they reasonably believe that the publication is in the public interest. The majority of reasonable persons within the unionist community are deeply unsettled by the harassment of the PSNI against their community, as evidenced by recent community protests and comments from elected representatives. The PSNI are also under investigation by the Police Ombudsman for malicious actions against the unionist community. With confidence in policing so low, it is clearly in the public interest for persons to publish some of the contents of a major PSNI data breach, in order to inform the wider public of the PSNI’s incompetence. Therefore it appears reasonable that anyone in possession of the notebook may be taking it to a journalist with a view to urging the publication of the material in the public interest. It would really be a matter for the PSNI to advise the public at large why it would not be in the public interest to expose the contents of their latest incompetence which could have placed many persons, including police officers, at risk had it fallen into the wrong hands. This latest farce comes only days after the Paramilitary Crime Task Force sought to use gullible journalists to deny a previous data breach which it was alleged took place in July. The PSNI selectively leaked the findings of their own internal investigation, despite the fact that the Police Ombudsman and Information Commissioner continue to investigate. They appeared to believe this would be some kind of ‘win’ for the PSNI, instead it appears to have backfired spectacularly. That amateur attempt at ‘spin’ came on the back of an internal PSNI decision to try and launch a more effective ‘communications strategy’ after almost a month of intense criticism following a range of gaffes by the press office and the Paramilitary Crime Task Force, some of which were compounded by the Chief Constable. The head of the PCTF, Mr Bobby Singleton, is currently under investigation by the Police Ombudsman for leaking to the media and issuing false and malicious press statements. The communications strategy took another dent last week when a leaked confidential bonfire report exposed the PSNI for their duplicity and malicious targeting of the unionist community. ACC Alan Todd then further compounded the PSNI’s humiliation by issuing a contradictory press statement. Jim Allister QC MLA and Kate Hoey MP have been extremely critical of the PSNI recently, with Mr Allister expressing alarm at how the PSNI were undermining unionist confidence in the police. This comes as a series of banners have been erected across unionist communities calling for an end to the PSNI harassment of the unionist community and our brave veterans. “In ordinary circumstances this would be the type of thing whereby the PSNI could seek the support of the local community to retrieve such confidential and serious information. But given this so called PCTF, which has been described to us by some community officers as a ‘Task-Farce’, has spent recent months torturing the unionist community, there’s no appetite to in anyway try and help the PSNI out of a mess of their own making. He continued “To be honest, most people I have spoken too think it’s good to see the PSNI getting a bit back and being humiliated. 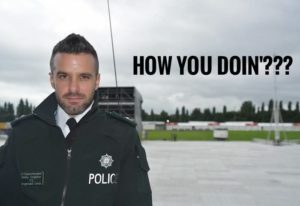 The good thing is that all the embarrassment caused to the PSNI recently has been done entirely within the law. No one in the community would support law breaking, rioting or graffiting walls etc, that is just silly. The community representative admitted that many people are privately enjoying loyalists humiliating the PSNI. “There’s a broad range of people that see the loyalist community giving as good as they get, and doing so entirely within the law. It is the first time in a long time the community is actually cheering them on. They appear to be using the PSNI’s own rules and the law against them and they are undoubtedly winning support. Let’s be honest, who doesn’t sit back and have a chuckle when the underdogs leave the Chief Constable and this powerful Task Force with a red face.